If you've followed TinkerTry for a while, you'll know that I'm kind of a speed freak. I strive to squeeze every last bit of performance out of my careful investments. I tinker with settings to get the best speeds because I enjoy being productive and creating content without having to wait for my system to catch up. I save my pennies for years, shop very carefully, then I pounce. 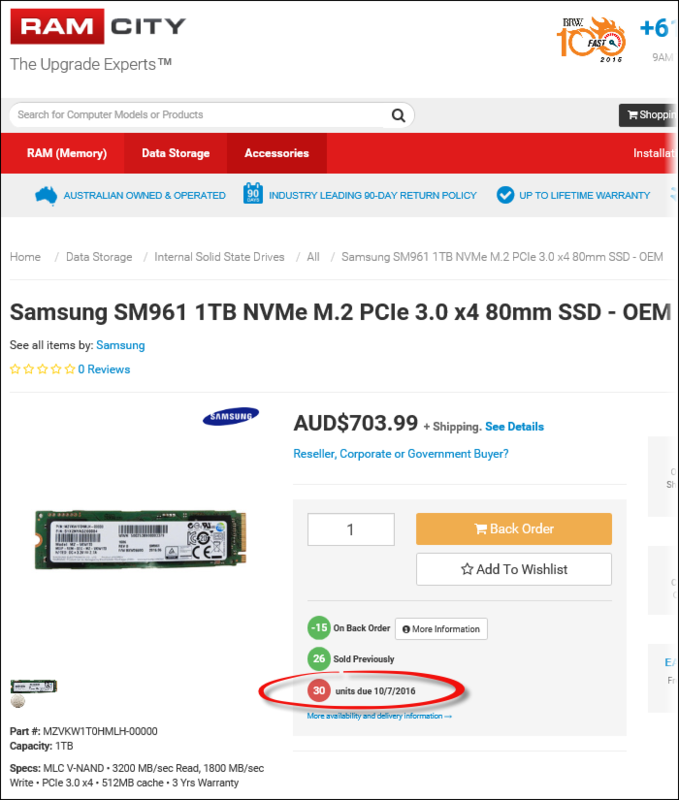 It really appears the long wait for a Samsung 950 1TB NVMe M.2 SSD is finally nearly over. Turns out it won't be arriving in the promised early 2016 time frame. It won't be arriving at all. Didn't take long. Late yesterday and today, news of the Samsung 960 PRO and Samsung 960 EVO arrived. 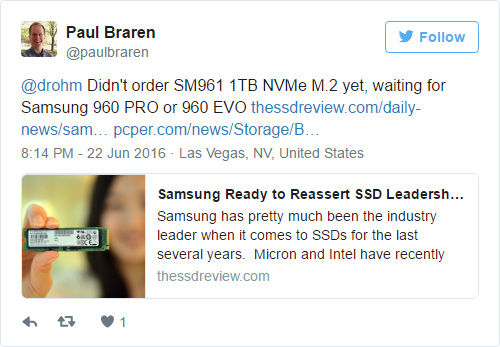 Brace Yourselves, Samsung SM961, PM961, 960 PRO and 960 EVO SSDs Are Coming! 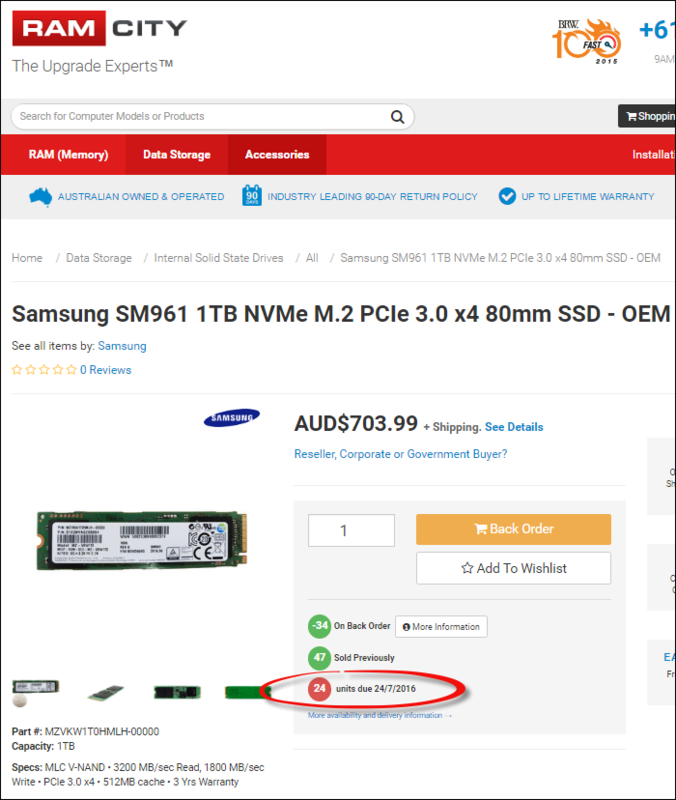 The SM961 has already been spotted for pre-order over at Ram City. Note that they currently list the 1TB, 512GB, and 256GB models, but at the time of this writing, all three product titles (incorrectly) state 1TB. That said, pricing appears to be well below the current 950 PRO retail for equivalent capacities. Also reportedly in the upcoming product pipeline are 960 PRO and 960 EVO models. While many awaited a 1TB version of the 950 PRO series, it would appear that Samsung has chosen to instead utilize the new 48-layer V-NAND to make a 1TB version as the 960 PRO. A logical extension of this would be a 960 EVO, which would represent Samsung’s first retail M.2 PCIe 3.0 X 4 SSD utilizing TLC NAND. One would expect a price point similar to that of the 850 EVO, yet with a significant performance boost via the faster PCIe interface. Allyn is actually about to talk about these Samsung SSD updates on the Live Stream tonight, June 22nd, around 11:15pm EDT. 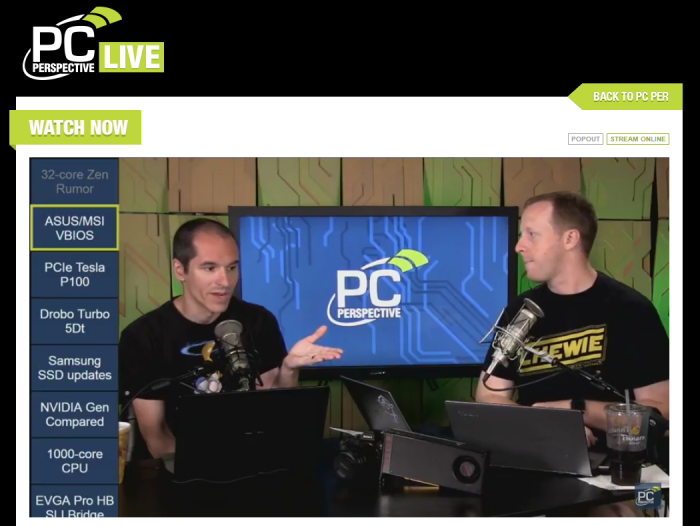 Click to visit PC Perspective Podcast episode #405. Allyn mentioned on air that the Samsung 960 PRO's Polaris controller might be more efficient, and theorized that the increased efficiency might be enough to avoid thermal throttling. 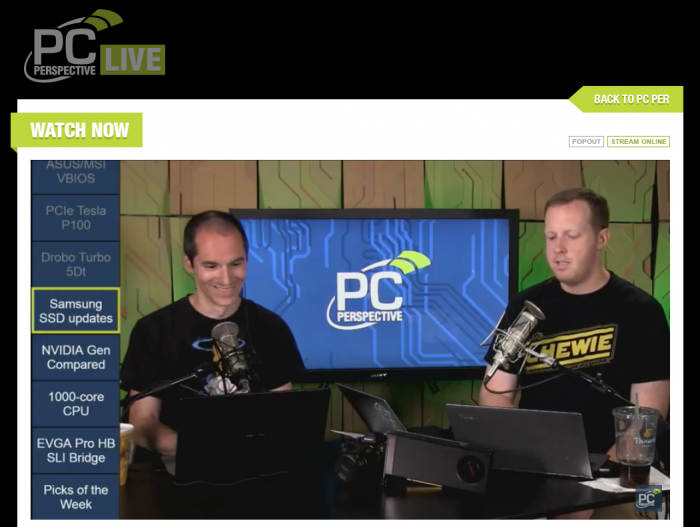 Podcast #405 - AMD RX 480 Hands-on, 32-core Zen rumors, VBIOS scandal and more! featuring order details, and pricing, and hands-on reviews. TinkerTry SuperServer home virtualization lab's storage tiers, platinum through bronze, guess how many efficient drives fit inside this tiny chassis? Samsung Announces 950 Pro SSD, Their First Consumer V-NAND + NVMe SSD. Samsung Launches 950 PRO - 300,000 IOPS and 2.5 GB/sec from a M.2 V-NAND SSD!